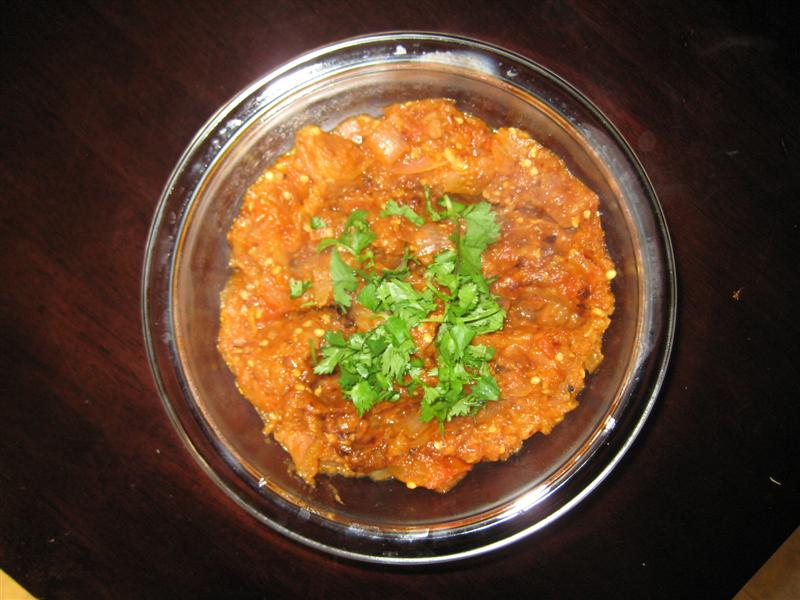 Traditional way of preparing eggplant in India.Spicy dish often made in summers. Broil egg plant for 20 mins each side.Remove the burnt skin and mash the eggplant and let it cool. Add chopped onions in non stick pan with 3 tsp. of veg oil. When onions turn golden brown in color add tomatoes and green chillies. When mixture starts leaving oil add salt and red chili powder. Add eggplant and mix it well. Let it cook for 10-15 minutes with closed lid. When it is ready serve with hot parantha’s or roti’s and garnish with chopped cilantro. It is not necessary to cook eggplant twice. Choose large eggplant, make three 1/2" deep cuts along length.. Tuck garlic cloves inside whole eggplant, bake in oven for 30 minutes at 400 deg F. Peel and mash eggplant and garlic cloves. Mix salt, dry roasted spices, and EV olive oil. Finish with cilantro garnish.